A slice of pound cake is buttery, rich and delicious all by itself, but it takes well to additions, too. Vary this cake’s flavor by omitting the almond extract and stirring in 1 tsp. finely grated lemon zest, 2 tbsp. fresh lemon juice and 1 tbsp. poppy seeds, or 2 tbsp. minced crystallized ginger. If you like almond, add the optional almond extract and sprinkle sliced almonds on top before baking. You can also top the slices with fresh fruit. Preheat oven to 350°F/180°C. Lightly grease a 8 x 4-inch loaf pan. Dust pan with flour. In a bowl, whisk together the flour, baking soda and salt until blended. In the bowl of an electric mixer, beat together the butter, sugar, vanilla extract and almond extract (optional) on medium to medium-high speed until light and fluffy. Add the eggs one at a time, beating well after each addition until just blended. Sprinkle half of the flour mixture over the egg mixture and stir until both are just incorporated. Mix in the cream cheese (or sour cream, if using), then sprinkle with the remaining flour mixture and beat until combined. Pour the batter into prepared pan and tap gently on the counter to even out and settle the ingredients. Bake in preheated oven until a toothpick inserted into the center comes out clean, about 70 minutes, or longer if using a metal pan. Transfer the pan to a wire rack and let cool for 15 minutes. Run a thin knife around the inside of the pan, invert the cake onto the rack and lift off the pan. Place the cake on one of its sides and continue cooling. 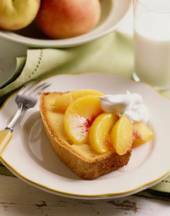 If desired, garnish with sliced peaches and whipped cream or non-dairy whipped topping. Serve warm or at room temperature. This is my favorite kind of pound cake there is nothing like it. I even asked my mom to fix it for me for my 20th birthday.